Just 100 of Seiko's Spring Drive Spacewalk watches, space-proof wristwatches being developed with a little help from the Russian Federal Space Agency, are expected to be made. Designed for Richard Garriott, the video-game honcho-turned-future space tourist, the titanium-encased timepiece weighs just 92.5 grams and is airtight, and waterproof to 100 meters. Seiko has developed a new luminescent material so that Richard will be able to see if it's teatime yet on the International Space Station, and it has large control buttons so that he doesn't have to take his space gloves off to adjust the time. Full specs are below. Spring Drive 5R86 movement for accuracy under the extreme temperature swings of space (-20° to +70° Celsius, or about -4° to 160° Fahrenheit). Titanium case with the sides etched out by a new CNC (computer numerical control) machine that Seiko built in order to help get the weight down to only 92.5 grams. Completely air-tight case capable of surviving direct exposure to space. Oversized buttons for use while wearing space gloves. Domed sapphire crystal with anti-reflective coating. Waterproof to 100m, or 330ft (in case of a water landing, I guess). GMT hand for 24-hour UTC time (which is used in both space and aviation). 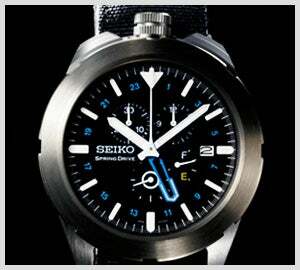 New luminescent material that Seiko says is three times as bright as a typical luminescent watch. A special dial and hand design for maximum readability.